I've received so many compliments regarding the transformation this screen has done for my backyard. The green color mixed in well with trees and grass. When a storm hit and a tree fell on my chain link fence I did my best in trying to repair it buy it was still was an eyesore. This screen covered imperfections and gave uniformity to create a new backdrop that looks nice. 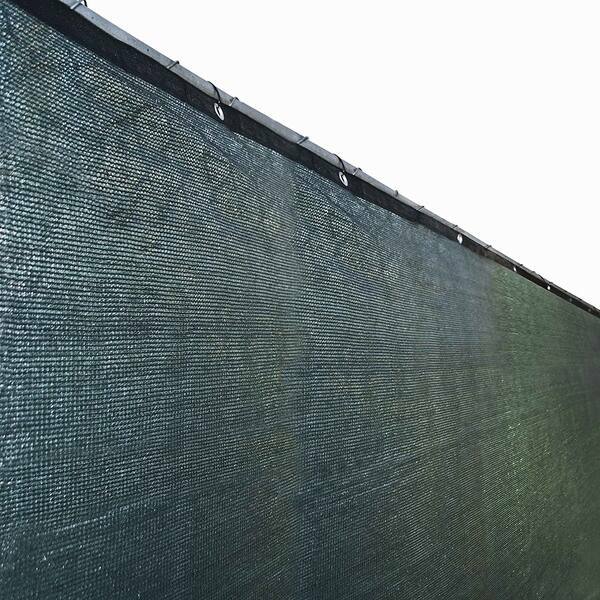 ALEKO 6 Ft x 150 Ft Fence Privacy Screen with aluminum grommets is ideal for commercial and residential fences needing a combination of privacy, air flow. This Privacy Screen is the most economical solution to provide the privacy you need and a clean look for any fence area, construction site, special event, back yard, or fence barrier, and is a perfect complement to landscapes and residential backyards. Heavy-duty knit structure with high-grade flexible material makes this product a very good protection of your privacy. It's made using knit oil-based polyethylene material which will not mold or mildew. This screen has 88%-90% visibility blockage; though, due to it's knit design it still allows for excellent air passage. It's the perfect solution for fence privacy in moderately windy areas. Dimensions 1800.0 In. X 72.0 In. Decided to buy this because it was on sale. Worked perfectly for what I wanted it for, basically to keep weeds from growing through the fence from my neighbors yard. Color gives it a nice clean look. Used it against my chain link fence on one side of my inground pool for privacy just what I needed worked perfectly! Perfect for what it is. This is a cheap fix for a temporary fence! I love it! Easy to work with. "Does this come in four ft high option?" "We have high winds in Oklahoma, how do you fix to fence with 8' sections of rod iron fence? Fence is 6' High and around 80 'long. Need to fix vertically about every 8'. Dale"
"We have high winds in Oklahoma, how do you fix to fence with 8 sections of rod iron fence? Fence is 6 High and around 80 long. Need to fix vertically about every 8. Dale"